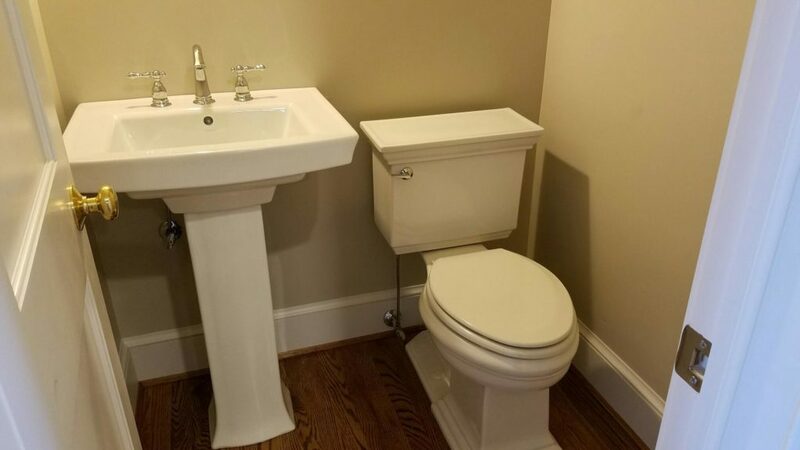 Powder Room Installation | Carroll Plumbing & Heating Inc. This elegant powder room was installed in the Forest Hill neighborhood of Richmond. Complete with all new fixtures, this powder room went from being dated and unwelcoming to a crisp and clean bathroom for the homeowners, their friends and family. Like many neighborhoods in Richmond, VA, homes in the Forest Hill area of Richmond’s Southside are older, oftentimes with outdated plumbing that makes renovations and plumbing installations a complex task best left to professionals. The plumbing technicians at Carroll Plumbing & Heating Inc. have a deep understanding of not only what makes older homes in Richmond unique, but how to update existing fixtures without compromising the original plumbing system. Whether you have a full house plumbing renovation, or just a half-bath that needs new fixtures, we have the experience to get the job done right. If you’re looking for plumbing installation as part of your renovation project, contact us today!